Am I alone in my quest for the perfect t-shirt? Why as a women does it always seem that our tees are less than perfect? The graphic tee has ramped up on the women’s end in the western fashion scene for a considerable amount of time, I’ll admit my closet is filled with too many tees featuring a cheeky western saying, a bucking horse graphic or cactus. I love them but, i still find myself checking out the tees in the men’s section. 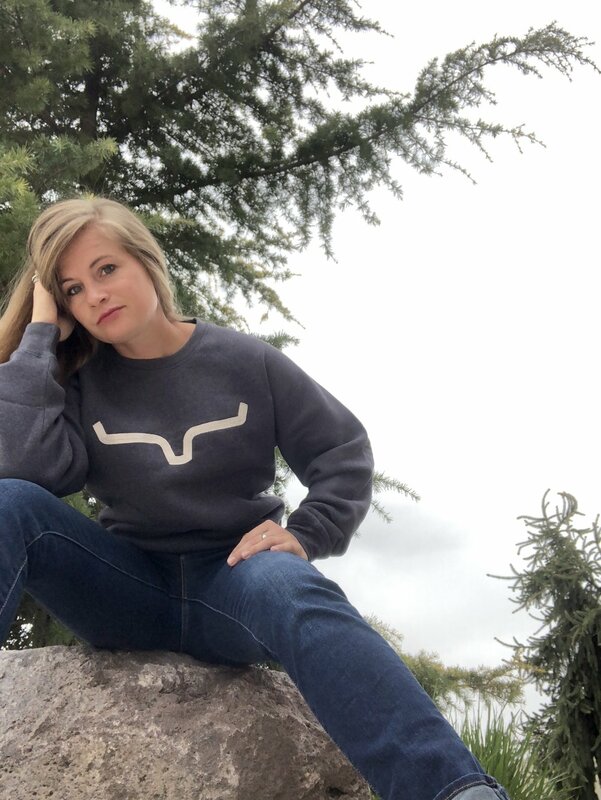 Like so many women before me, a men’s sweatshirt or tee is just better! They are softer yet seem more durable. Sure the women’s tees flatter curves or show off cleavage (if you have it) but in the men’s section you can find a tee with identical large logos or graphics in about 12 different colors! That being said, here are several ways to style a men’s tee or sweater without losing that feminine touch. Crew neck sweaters are making a comeback. Though I’m always a sucker for a hoodie, a crewneck feels stylish. If you love Dirty Dancing and Flashdance, then you’ll love this look. Utilize the length and box style of a men’s crewneck sweater over leggings or a cuffed skinny with simple shoes. Great for lounging around the house, travel days whether in the truck or on a plane or just enjoying the changings seasons. Buying on a bargain can give you some confidence for the next task. Cutting the neckline. Cut a small triangle from the front to show some collarbone, or cut out the neckline completely for an off the shoulder look. Both are easily paired with skinny jeans or trousers for a sheik, on-trend look. Scared to cut? Roll the sleeves for an easy womanly touch. If you’re a “lucky girl” whose worked hard in the gym and want to feature a rocking mid-section tying a tee or cutting it creates the perfect peekaboo look. If you’re a “real girl” and want to create the illusion of a waistline try tucking the tee into a skirt or high-waisted pair of jeans, belts are another great option. Layer it up! Jackets and vests are a great way to show your own personal flair. If you aren’t already be sure to follow me @TheWesternFashionPaige on Instagram and Facebook. Can’t wait to see your looks!